Gibraltar is a key route for bird migration and world famous for bird observation. The Definitive 2008 ‘Birds of the Rock’ (opp. page right column) features the Woodchat Shrike, Balearic Shearwater, Eagle Owl, Razorbill, Greater Flamingo, Egyptian Vulture, Med Shag, European Bee-eater, Hoopoe, Bonelli’s Eagle, Blue Rock Thrush, Honey Buzzard, Lesser kestrel. The 2009 addition to the Definitive (opp. page left column) features: the Black Stork, Osprey and the Northern Gannet. 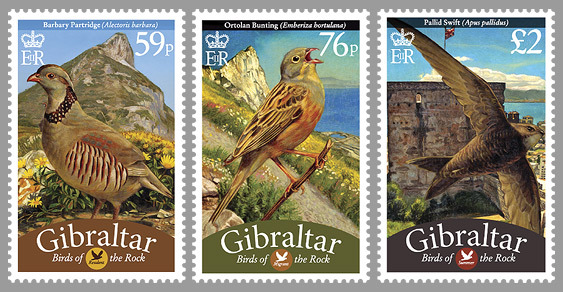 The 2010 addition to the Definitive (this page)features the resident Barbary Partridge (Alectoris barbara), the Ortolan Bunting (Emberiza hortulana) and the Pallid Swift (Apus pallidus).